The University of Oregon’s application for a new city-issued conditional use permit has entered the public comment phase, with a public hearing scheduled for Wednesday, Sept. 12. The permit, covering 77 acres on the north side of Franklin Boulevard, provides a framework for potential land use in the coming decades, so the university could improve and develop the land as needs and opportunities arise. The plan defines basic uses where 60 percent of the acreage between the railroad tracks and the river is dedicated to conservation, 20 percent for other open space, up to 16 percent for recreation fields, and roughly 4 percent for buildings. 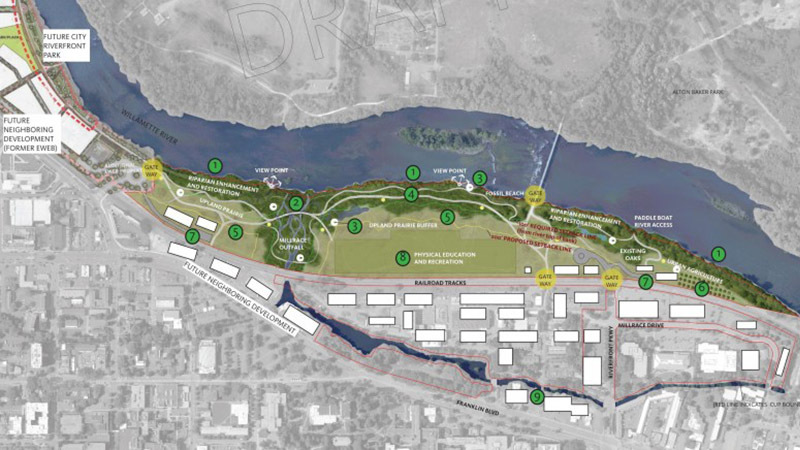 Some 25 acres along the entire length of the university’s riverfront property are designated for conservation in the proposal and would allow for riparian enhancement and restoration, boardwalks, outdoor classrooms, soft trails, an improved bike path, paddle craft launch, improved views and access to the river. Dedicate land between the railroad tracks and Willamette River primarily to conservation and open space. Concentrate most of the potential building development south of the railroad tracks. Establish a 200-foot development setback from the top of the riverbank, twice what city code requires. Dedicate 31 acres of the total 77 acres to conservation in addition to other open space. Establish building coverage and heights well below city code allowances. Improve pedestrian and bicycle connectivity, and provide no new through roads. Allow the addition of one new recreation field for a total of three fields. Locate them further away from the river and mitigate stormwater and lighting impacts, if they are built. "Our planning process began more than three years ago and it has included an incredible amount of public outreach,” said senior planner Emily Eng. “Among many in the community, there is excitement about the opportunities made possible by the conditional use permit for a safe and active riverfront that connects people to the Willamette River and serves as a significant educational resource." If approved, the permit would be a framework for developing the land as opportunities arise, but it is not intended to cement decisions. The proposed permit would be in place for at least 20 years. The last was in place from 1988 to 2012. Its key component is the master site plan, which uses the concepts of the Framework Vision Project as a foundation while meeting the requirements of the city land use code.